In light of the recent tragedy in Las Vegas, I wanted to take the time to clarify some of the most troubling questions and common misconceptions about automatic weapons. It has become an unfortunate habit for the American Media and liberal politicians to cry for tougher gun control after attacks like this one. Nevertheless, the evidence indicates that stricter sanctions on firearms would only cause more damage, as I’ve previously illustrated in my piece debunking the most common myths about gun control. One of the biggest problems with the gun control debate is that the liberals love to say whatever comes to their minds, completely pandering to people’s emotional responses. In just one day last week CBS and CNN were guilty of some of the worst reporting I have ever seen – After the majority of the mainstream media erroneously reported that the Las Vegas Shooter had used automatic weapons, CBS declared that he used “automatic rounds” … I mean I couldn’t make this stuff up even if I tried. In this week’s Gunivore Exclusive, we’re going to assess the history, legality, and availability of automatic weapons in America. Because this is such a controversial topic that’s also uncharted territory for many folks, I felt it was crucial for our readers to have objective and reliable information. Since moments like these often cause people to abandon reason and embrace emotional responses, the truth must be laid out on the table. As the people who understand the necessity that is the right to bear arms, it is our responsibility to be armed with the tools necessary to debate gun control. Very often left-wing politicians attempt to sponsor bills that would ban guns purely based on their appearances, nonspecific and inaccurate definitions, and misinformation (ignorance?). One of the best was when a state legislator from Colorado tried to categorize an old-fashioned double-barreled shotgun as an assault weapon. Similarly, even though there are several federal and state laws banning certain types of weapons, not understanding the ins and outs can be a fatal mistake. Take the Sandy Hook Shooter for example. He used a Bushmaster XM-15 Rifle that wasn’t even technically an assault weapon under state or federal law, in a state that has decently strict gun laws. The real kicker is that many of the proposed gun control bills would enable companies to continue to produce firearms like these as long as tiny changes were made, sometimes as trivial as a name change. My point is that absentminded, negligent legislation is both pointless and potentially harmful. According to the ATF, a machine gun/automatic weapon is one that shoots or can be reconfigured to shoot, automatically more than one round, without manually reloading, by a single function of the trigger. Conversely, a semi-automatic firearm will only fire one bullet for each pull of the trigger while also preparing the gun to fire another round. There’s no better place to start than the beginning – The machine gun got its start midway through the 19th century with the infamous Gatling Gun. Although this behemoth was capable of firing approximately 200 rounds/minute, it was still not truly fully automatic since it was still hand-powered via a crank. 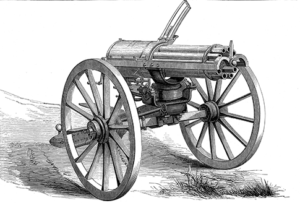 The rapid-firing Gatling enjoyed many years of military success, but it was the Maxim Machine Gun that was the world’s first true automatic weapon. While working in London, the American inventor devised his iconic machine gun that was not only capable of continuous fire, but also utilized recoil energy for reloading. Originally developed in the late 1880’s, it didn’t take long for this high-powered weapon to become a military staple around the world by the turn of the century. While firearms pioneer John Browning was perfecting these repeating guns in America, the Europeans eventually caught up. During the early part of the 1900’s, the French created the St. Etienne Mle 1907, the Brits built the Vickers, and the Germans designed the MG 08 – but ultimately it was the American models who have withstood the test of time. Now that we have a more comprehensive understanding of automatic and semi-automatic guns, it’s time to clarify some huge misconceptions perpetuated by the Left and mainstream media. Legislation for automatic weapons began during the reign of President Franklin Roosevelt with the National Firearms Act of 1934 (NFA). Prior to this landmark regulation, machine guns could be bought at your local gun store or even from mail order catalogs. Many historians attribute this lackadaisical approach as a major factor for the rise of organized crime in the United States. 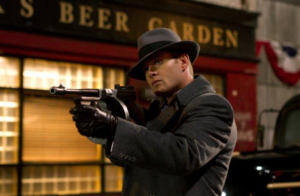 One of the most popular firearms during that era was Auto-Ordnance’s Thompson Submachine (Tommy) Gun which found its way into thousands of civilian hands. Although the NFA didn’t actually make automatic weapons illegal, it did make them wholly unaffordable for most Americans. 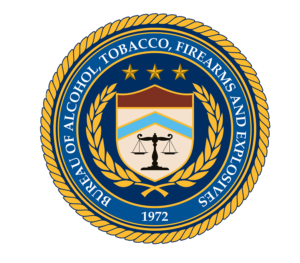 Additionally, the NFA required potential buyers to submit a background check and a lengthy application which had to be signed by the local chief law enforcement official. Lastly, besides for regulating automatic weapons, the NFA also banned suppressors, short-barreled rifles and explosives such as grenades. The next big hit to the gun community was in 1968 with the infamous Gun Control Act which effectively banned any imported firearms that were branded to have “no sporting purpose”, including all “machine guns”. The next major overhaul in American gun control came nearly 20 years later with the 1986 Firearm Owners Protection Act. Once this amendment to the NFA passed, the date May 19th, 1986 would forever live on in infamy. Under the Firearm Owners Protection Act, automatic firearms aren’t actually illegal but the laws surrounding civilian ownership are lengthy and complicated. For starters, if the gun in question was manufactured after May 19th, 1986, only dealers licensed by BATFE may own, produce, or sell it. Let it be clarified that this means that it is unequivocally illegal for a civilian to own an automatic weapon produced after 1986. Clearly, the government has made huge strides in limiting the number of civilian-owned automatic firearms. In fact, it’s even illegal for any company to make new replacement parts for pre-1986 automatic guns. 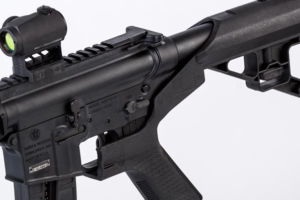 While often overlooked, this complex legislation also imposed further limits on the already-prohibited products listed in the NFA. While weapons producers must acquire a Federal Firearms License (FFL) to produce regular arms, those manufacturers looking to make guns restricted by the NFA must obtain an additional federal license. The federal mandate further dictates that pre-1986 automatic weapons may only be distributed by a Class 3 FFL and must be thoroughly registered with BATFE. This comprehensive ordeal includes extensive background checks, fingerprinting, hundreds of dollars in taxes and fees, and is only complete once the owner is included in a federal registry featuring their personal information and serial number of the licensed NFA product. That being said, there are three types of automatic weapons available to civilians in the United States. The first category – if you’re lucky enough to get your hands on one – is called “transferable guns”. These firearms were manufactured prior to the 1986-ban and are the easiest to own, legally speaking. However, they are so rare that there are only an estimated 180,000 of them floating around the States. Transferable essentially means that the gun can be transferred between citizens through a properly licensed Class-3 dealer after filing either a Form-3 or Form-4. But, even if you are able to track one down and fill out all the proper paperwork, these highly sought-after firearms tend cost anywhere between $10,000 and $50,000. 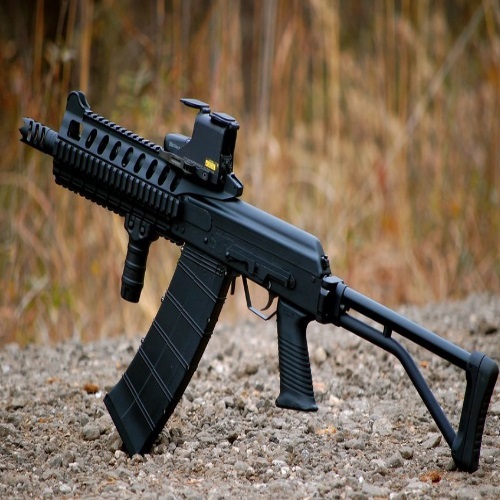 The 2nd class of automatic weapon is the Pre-Sample, which are those guns imported between 1968 and 1986 that were illegal for civilian-ownership. These were only permitted for Class-3 dealers and can only be transferred to other Class-3 dealers. The only exception to this rule is that a dealer may keep a Pre-Sample automatic weapon after giving up their license. Lastly, we have the toughest and rarest group, the Post-Samples. These automatics were made after the 1986-ban and only permitted for dealers, law enforcement, military, and manufacturers. Not only do manufacturers have to pay a tax to produce these guns, but dealers can only get their hands on them if the local law enforcement can convince the BATFE that they want a demonstration of a particular automatic weapon. The major difference between these and the Pre-Samples is that the Post-Sample guns must be sold or destroyed by dealers once they give up their license. If these options don’t suit you, there is still one more thing you can do to get your hands on an automatic firearm legally. If you are fortunate to find a seller offering a legal NFA full-auto sear – the machined component of the trigger group that enables automatic firing – just dish out the $20,000-$50,000 and you’re in business. Well, actually it’s not that simple. Even in the unlikely event you can find, afford, and purchase a legal auto-sear, the gunsmithing tools and knowledge necessary to modify a semi-auto into an automatic are pretty hard to come by. But what about those bump stocks that everybody keeps talking about? Although the NRA was quick to concede that these devices, used to make semi-automatic rifles capable of rapid-firing, should be regulated, I’m not sure they were right to have made such a bold statement. Many people might wonder how one could even argue against a ban on these tactical accessories, but let me introduce you to the 2nd amendment. For starters, we must all acknowledge that “necessity is the mother of invention” and if it’s not bump stocks, it will be something else, and that pattern will never cease. Therefore, a ban on bump stocks signifies a slippery slope of gun control that we cannot let happen. Bump stocks, by all government definitions, do not turn a semi-auto into an automatic and the conversation should stop there. Instead of firing multiple shots with one trigger function, bump stocks utilize the recoil force to speed up the number of trigger pulls – that’s not automatic firing, that’s just genius engineering. Secondly, these revolutionary attachments have already been approved twice by the Bureau of Alcohol, Tobacco, Firearms, and Explosives under the Obama Administration. The whole debate about bump stocks got me thinking about why pro-gun advocates don’t put up more of a fight against automatic weapon regulation. I think most people’s first inclination is that they are a completely separate grade of firearm – capable of causing a lot more potential harm – and should therefore be regulated by the government. The problem with that logic is that it seemingly goes against everything the 2nd Amendment stands for. 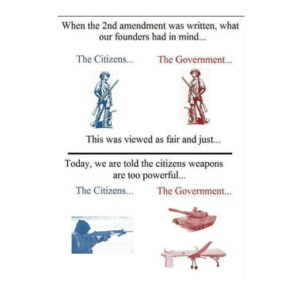 Theoretically speaking, why shouldn’t we have access to the same arms and munitions as the government, if the Constitution granted us the right to protect ourselves from governmental tyranny? Now I’m not saying we should all have access to tanks (maybe? ), but there is definitely a solid case for leveling the playing field in terms of small arms. So there you have it – a clear and concise breakdown of automatic weapons in the United States. Most gun enthusiasts agree that the government should be limiting civilian access to these automatic weapons, but the feds have already had it under control for decades. I want to point out that I purposefully only discussed the legal ways and means to procure an automatic weapon and specifically chose to omit any mention of illegal procedures or methods. Besides for the fact that this type of illegal activity is uncommon it is also not relevant. If someone will try to say that criminals aren’t following the laws anyway, I’ll sit back and laugh as they have just perfectly summed up one of the many reasons why gun control is an ignorant and counterproductive response to violent crime.